Has your child recently gotten his or her permanent back molars? You may hear a recommendation from your dentist for dental sealants at your child’s next dental exam. Dental sealants are typically placed on the six-year molars and twelve-year molars after they’ve fully erupted. This quick and easy dental procedure is designed to protect your child from cavities in highly vulnerable areas of their smile. A dental sealant is a thin plastic coating that your dentist will “paint” onto the chewing surfaces of your teeth. This works to seal out bacteria, food debris and plaque, preventing it from accumulating on the pits and grooves found on the back molars. Getting dental sealants is a simple and painless process. First, the teeth will be cleaned, rinsed and dried. Next, an abrasive gel is used to make the tooth surface slightly rough. The tooth is then rinsed and dried again before the liquid sealant is painted on. Finally, a special curing light is used to harden or solidify the sealant. Rest assured that sealants are a tooth-colored coating that others won’t notice. Your dental sealants are designed to last many years, but a reapplication can be applied if necessary. Why are children prime candidates for dental sealants? 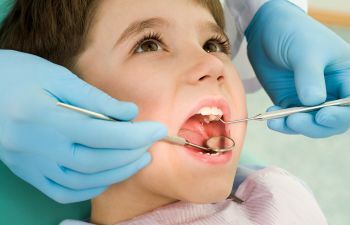 The primary reason that kids benefit from sealants is because children have a high rate of tooth decay occurrence on those newly erupted molars. Often the bristles of the toothbrush are simply too large to effectively clean the deep grooves of these chewing teeth. While fluoride toothpaste can protect the smooth surfaces of the teeth, the pitted surfaces often harbor bacteria and germs. Unfortunately, this leads to tooth decay and the need for a dental filling to restore the tooth. Dental sealants can be considered a “no brainer” solution for a number of reasons. Not only is the procedure non-invasive and quick, but sealants are also affordable and they don’t pose any aesthetic threat to your child’s smile. While dental sealants are commonly applied for children and young teens, there are cases when adults can benefit from sealants too. For more information about dental sealants, please call Georgia Orthodontics & Children’s Dentistry. We are proud to offer comprehensive pediatric dentistry at our practice, including the most proven methods to protect the health and beauty of your child’s smile.